Chickens can be wonderful pets for adults of all ages. As consumers, we take chickens for granted, but unless an individual or a family decides to raise chickens, most of us never discover how incredible these birds are. Chickens are a great way for kids to learn how to raise livestock. Chickens are extremely intelligent and social animals. Chickens love to play; they play with each other and will also play with humans. Chickens are very social animals and need lots of company pretty much like we humans do. So ensure that you buy at least a dozen or so chickens. In this way, the chickens will be happy and you will also get used to caring for the chickens as well. 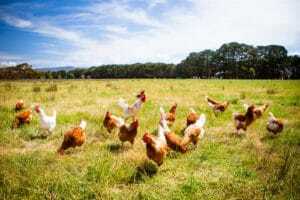 While most chickens are kept on farms to produce eggs and are used for their meat, many chickens are also kept as pets by urban and suburban people. A few decades ago, keeping chicken as pets became very popular. 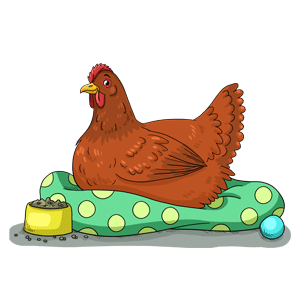 Having eggs that were homegrown also became very popular, and chicken owners also found that chickens got rid of insects and larvae. For one, you need to make sure that you have enough space for your chickens. Of course, the more space the better. If you are keeping the chickens in a coop, you need at least 10 square feet per chicken. They love to have room to forage. 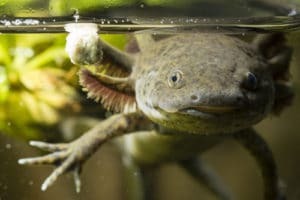 It’s best to have plenty of outdoor space for them, but if you live in an urban area, you will need to keep them confined so that they do not disturb neighbors. 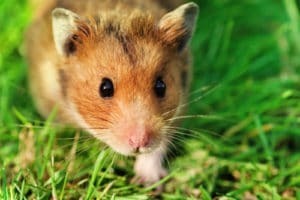 If they have a small run area, also keep in mind that they will scratch up the soil and dig holes for dust baths. Are you able to dedicate the proper amount of time every day to care for your chickens? 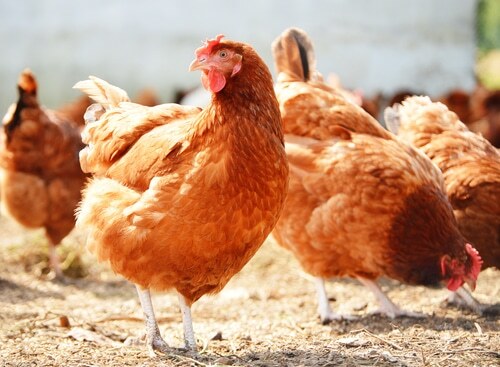 While they are pretty much low-maintenance pets, chickens do need maintenance and care. If you can’t spend the right amount of time with your chickens, then perhaps they aren’t for you. If it’s legal to keep chickens as pets in your town, you must consider the neighbors’ approval, especially if they live close to you. It’s a good idea to talk with them to answer any questions or concerns they may have. Your neighbors won’t mind the fresh, free eggs that are in store for them, that’s for sure! Finally, make sure that you can afford to take care of your chickens properly. It costs money to build coops and purchase the supplies, not to mention buy the chickens themselves. So even though you will be getting “free” eggs, there is a cost to maintaining your brood. This is good if you’re someone who works a lot, or you’re a busy mum. As long as you have a pair together, they’re quite happy to hop about their cage or aviary all day long. They don’t need walking and they don’t make a huge amount of mess. 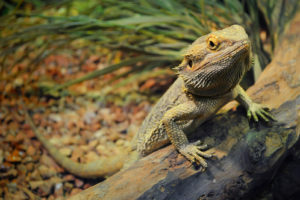 From Zebra Finches to the Cut Throat Finch with its red throat feathers, to the more exotic Parrot Finch, there are a number of different types of pet to choose from. You can mix some types of finches, but it’s worth taking advice before you do. Although birds would always prefer a larger space to fly about in, finches don’t need a lot of vertical height due to their size. You will need to make sure they have at least 30 inches to fly across, though, as they love flitting about all day long. 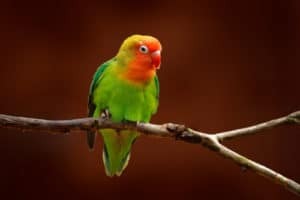 However, compared to a larger pet bird, they need a much smaller cage or aviary. Lots of finches are songbirds, and have a beautiful singsong call. 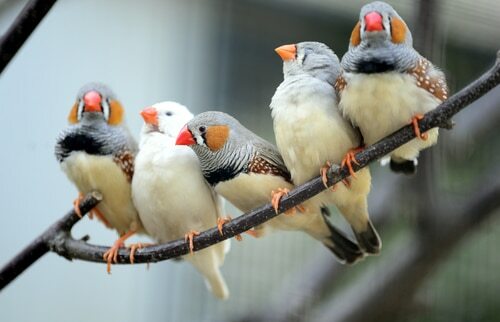 Zebra Finches are known for their long and complex songs. If you live alone or would like a companion, get a pair of Zebra Finches and you won’t feel lonely at all! So a finch makes a great first-time pet, but it’s important to make sure you give them the right pet care. Finches need sunshine, so make sure their cage or aviary is positioned in a sunny area with a place for shade when needed and somewhere where they can get away from busy areas as they don’t like a lot of noise or being around people all the time. Make sure you have lots of swings or perches for your finches to fly to – they love this. Don’t worry about buying them toys though. They would rather hop from perch to perch, eat their seeds and have a sing! Budgies can make great pets in smaller homes or apartments and, what’s more, you can spend time teaching your budgie to talk to enhance your relationship and create a rewarding bond with your bird. Budgies are sociable birds, so the initial step in teaching your pet to talk is to ensure the cage is located in an area where social interactions happen frequently. 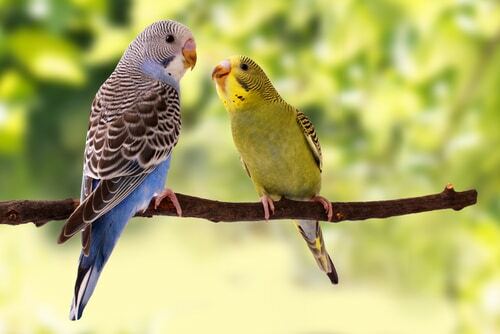 Budgies will mimic the sound of human voices and conversations, so the more opportunity your budgie has to listen to you speaking, the greater chance he will learn to talk. Spending time bonding with your budgie and hand training him is another important factor in the language learning process, as tame budgies are more likely to speak than untrained birds. 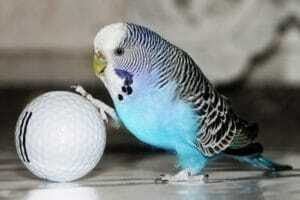 Ideally, you should only have one budgie in the home if teaching your bird to speak is an important consideration. A pair of budgies will interact with each other and be less interested in learning to interact with humans. Once your budgie is trained to sit on your hand quietly you can start the process of teaching him to talk. You should speak to him in an enthusiastic manner, as this will excite him and motivate him to speak back to you. Budgies adopting a language learning mode will have dilated eye pupils and stare intently at your mouth. Always greet your budgie when you arrive home and say goodbye when you leave. He will also learn individual words if you repeat them to him on a regular basis. Regular word repetition and word association helps budgies to learn. Your budgie is capable of learning single words and short phrases, so taking the time to talk with him on a regular basis will enhance his learning capabilities. When he begins to talk his words and phrases may be unintelligible but if you provide constant verbal encouragement to him his attempts at speech will soon make sense.